If you have noticed changes within your web browser's default settings, you should be aware of the fact that they are most likely triggered by a browser hijacker. A hijacker that goes by the name of Mysafenewpage.com and is known to be rather active nowadays is fully capable of triggering alterations without any notification. If you ever come across it, make sure not to install or even download it. This is important since having this intrusive program active on your PC will cause various interferences almost every single time you decide to surf the web. Unfortunately, this is not the only feature of this hijacker that is a reason we recommend conducting its complete removal. Malware experts working at our internal labs have discovered that in some cases Mysafenewpage.com could expose you to suspicious and potentially malicious web content. If you think of yourself as a security conscious user, make sure to execute a complete removal of this browser hijacker as soon as it is found up and fully running on your PC. You can do so by following the simple removal instructions that we present below. 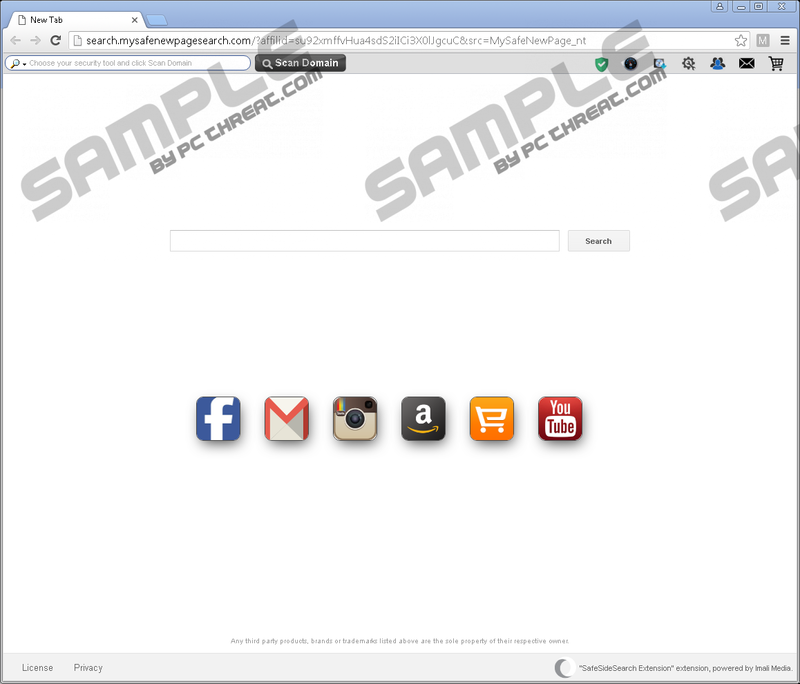 The primary indication that Mysafenewpage.com is up and fully active on your personal computer are changes triggered within popular web browsers such Google Chrome, Mozilla Firefox, and Google Chrome. Such broad compatibility signifies that nearly every Internet users could be affected by this hijacker. The changes made by it will be of your default search engine and homepage. These seemingly irrelevant changes will affect your overall online experience in a negative way because you will be forced to start every single online session on a dubious third-party site set as your new default home page by the hijacker in question, whether you like it or not. Virtually the same thing will happen in regards to your search engine. For as long as this invasive program is up and running on your personal computer you every single online query will go through a newly appointed third-party search provider. It goes without saying that such activity of Mysafenewpage.com will alter your overall online experience for the worst. Do not hesitate and complete the full removal of this intrusive browser hijacker at the very same time that it is found up and running on your personal computer. It is critical to state that only a complete removal will help you restore the default settings of your web browser once and for all. Changes made by Mysafenewpage.com and the annoyance caused by them should be more than enough make you realize that the removal of it should not be delayed. Unfortunately, that is not all that this hijacker could be responsible for. Researchers at our internal labs have discovered that in some cases using the newly appointed search engine could turn out to be a major risk. This is so because the dubious search provider could present you with modified results, which could consequently lead you to questionable third-party websites. Clicking on such a result could have detrimental outcomes, to say the least, as you could be taken to sites running an arbitrary code execution exploit, meaning that just entering it could be more than enough to get your PC infected with some unknown malware. Even though such search results are not presented often, it remains a possibility that could have detrimental outcomes, to say the least. Do not risk and conduct a complete removal of Mysafenewpage.com without second thoughts as it will help you to reestablish proper virtual security. The removal instructions that we present below will allow you to delete Mysafenewpage.com in its entirety if you follow it carefully. Make sure to execute each step precisely because just a single mistake could result in an incomplete removal of this browser hijacker. To avoid finding yourself in such a situation, make sure run a detailed analysis of your PC for potential leftovers linked to Mysafenewpage.com. If anything reacted to this browser hijacker is found - make sure to terminate it. If you believe that this might be too complicated - make sure to delete this intrusive program by using a professional antimalware tool as it will allow you to do so in an automatic manner. Quick & tested solution for Mysafenewpage.com removal.